My grade 5 class was onto the project part of the lesson (part 5) in their textbooks. Rather than do the dull writing activity, I wanted to do something more fun and interactive. So, I decided, why not make our own Class Menus? First, I found this great song called "Do You Like Broccoli Ice Cream?" by Super Simple Songs. I've used it for grade 1 and 2 in the past and it's just such a cool and fun song to use when studying food. It's also perfect for this lesson because it uses the phrases "Yes, I do." / "No, I don't." and "Do you like _______?" - these phrases are all in the textbook, so the song is a brilliant find. Oh and I recently discovered they made a cute sequel! 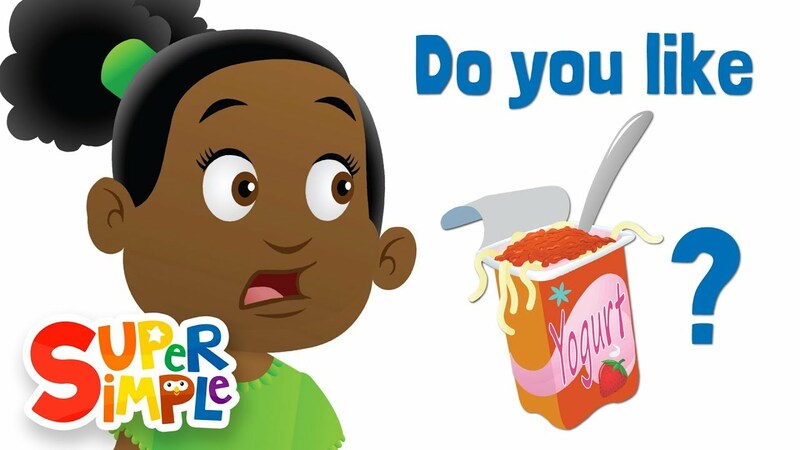 It's called "Do you like Spaghetti Yogurt?" I am definitely going to show it to my grade 5's when I see them next. Download it for free at my teachers pay teachers page. 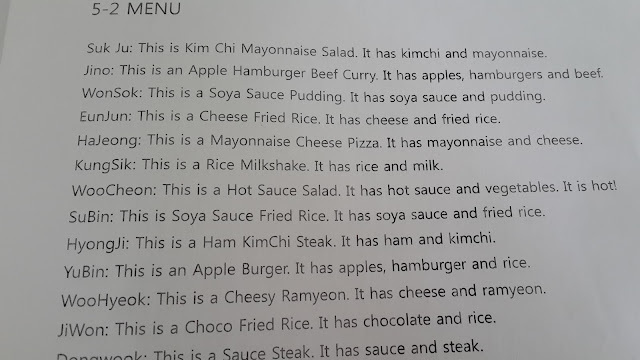 The first slides summarize the foods in the song and practice the key sentences that the project requires them to write - "This is a/an _________." "It has ________ and ____________." I left blanks so that students could come up and write on the board. After I told them that they will make a Class Menu. So everyone in class must write about 1 food and also write what the food has. "This is a ___________. It has _____ and ________." 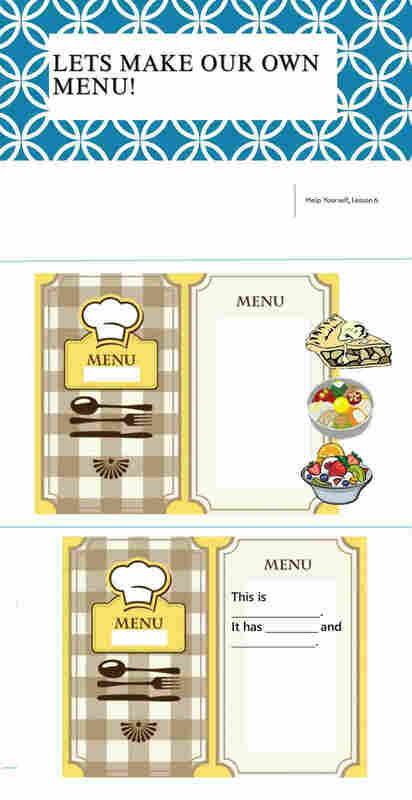 We praticed with the menu items that were on the project page of the textbook first. I had students come to the board to write the sentences on the slide. Download my PPT for free at my teachers pay teachers page. As you can see, the middle slide above has a picture of an apple pie, bibimbap and fruit salad. This was a good way to practice foods they know and what they have inside them (ingredients). Teacher: Good. This is an apple pie. It has, what? Students: It has apples and jam. " So finally, I told them they must not copy each other and everyone should have an original food to add to their Class Menu. They had to write the 2 sentences in their English notebooks then bring it to me to check. I typed it all on a word document with their names. I plan to print and decorate them and hang them in the classroom. I've yet to finish this as I see my last grade 5 class on Monday - So I'll print and make the menus then. Hope you can do this to spice up your project lesson. The students were really keen to get creative and I found that reading previous class menu ideas to the new classes made the students more excited to be even more creative and fun. And just like the "Do you like broccoli ice cream?" song, I told them they can make some not-so-delicious items - "crazy food" is ok! 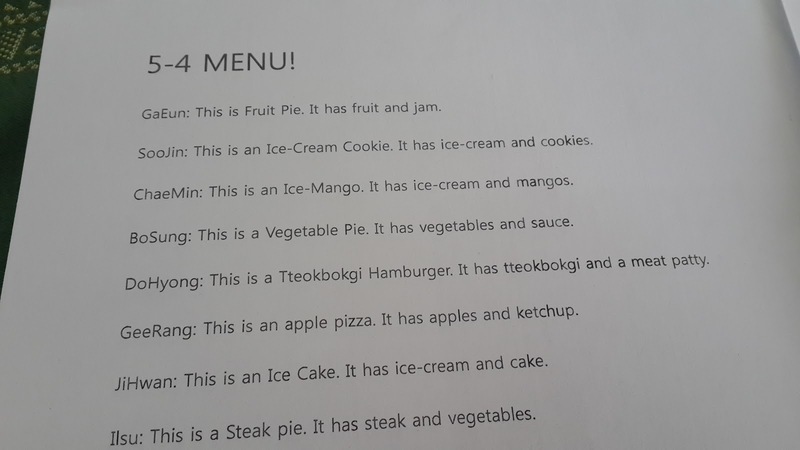 haha, it also means that they are using more vocabulary as they had a chance to name a few more food items outside the textbook vocabulary.